Dell Appassure 5 is a new product that was announced on our website several days ago in this article. Today we will be looking under the hood and do an installation, configuration and brief test in our lab. The Dell Appassure 5 is designed to backup, replicate and recover Windows systems—both physical and virtual machines. Appassure 5 works across VMware vSphere, Hyper-V and Citrix XenServer environments. The product is backwards compatible with vSphere 4 and can be used for backing up individual ESX/ESXi servers. Versions 3.x, 4.x and 5.x are also supported. If you’re not fully virtualized yet, the product can be used to protect physical servers too. The product is composed from two main parts. The AppAssure 5 Core and the Appassure 5 Smart Agent which is installed on the VMs to be protected. The smart agent is a lightweight agent which detects the applications installed inside of the VM and it carries out application aware backup and recovery. The smart agent tracks changed blocks on the disk volume and creates snapshots which are sent to the main core in order to provide near-continuous data protection. The default value between snapshots is 60 min, but one can easily set snapshots for every five minutes to protect any application where more recovery points are needed. The AppAssure 5 Core is the central component – the console of the whole system. It is web-based and enables you to manage the whole backup infrastructure, create and monitor backup jobs etc… That’s what we install first. The core uses target-based inline compression, encryption and data deduplication of the data received from the smart agent. The core then stores the snapshot backups in a repository. The storage repository can be local disks, NAS, SAN. The installation. (The entire installation took about 10 minutes). You have to make sure that your system meets the minimum hardware and software prerequisites and you can start the installation of the AppAssure 5 core. The Core can be installed on W7, W2008, W2008R2 – x64 architecture only. Hardware requires 8Gb of RAM at the minimum and dual core CPU. My system is a PC with Intel i7 920 Quad Core with 16 Gb of RAM. It’s one of my whiteboxes where I run ESXi. I’ve transformed it into physical W2008R2 host for the time of this review. 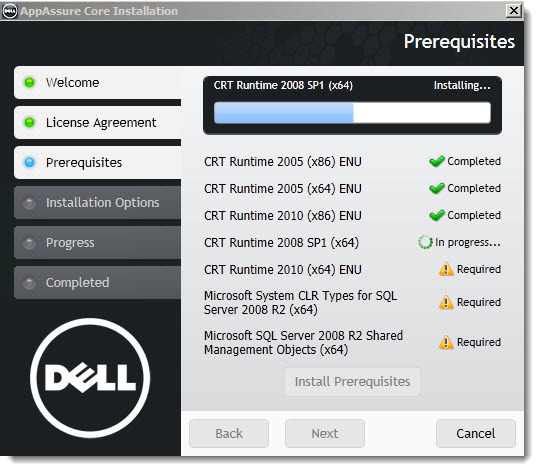 At the beginning of the installation you’re presented with a nice screen which warns you that the required prerequisites be installed. Then the installation moves on without further intervention and a desktop icon opened my web browser on this page: https://mysystem:8006/apprecovery/admin. (a certificate error is normal since the local system don’t have a valid certificate). After Openning the console, the necessary setup. What’s needed? A repository to store the backups. I went and choose one of my local disks to dedicate to the storage database. As you can see, there is a possibility to store the backups remote location via CIFS share as well. You would certailnly want to configure the E-mail reporting in order to receive the daily backup report every morning. You can do it through the assistant while configuring the storage repository or through the menu Configuration > Events > Emails SMTP settings. You have an option to create encryption keys, so your backups are encrypted. This is certainly useful when you replicate over the WAN or to a cloud datacenter. There is no limit to the number of encryption keys that can be created and stored on a system. The AES 256-bit encryption in the Cipher Block Chaining (CBC) mode with 256-bit keys is used. Encryption is performed inline on snapshot data, at line speeds without impacting performance. As you can see, one of the options is an encryption of the backups. Good news for AppAssure, looks like a solid upgrade. My company is currently on 4.7 which is an amazing piece of software. I’m eager to get my hands on 5.0 now that its mainly web based as management will be easier. One tip to the Author of the article, please proof read. The product sounds like it performs backup of VMs through an agent in the OS. Does it not use the ESX APIs at all? Therefore no SAN based backup? That’s not much different than a traditional backup. When you virtualize, one of the advantages is the ability to perform .vmdk or .vhd level backups for efficiency during backup and ease of DR restore. We both know what quote does mean, right? You mentioned configuring the E-mail reporting in order to receive the daily backup report every morning. Can you please explain more on how to setup the daily automated reporting? i know this is a bit old but i was wondering if anyone was able to use the virtual standby feature? If i have VMWare licenses (or workstations) can i create a virtual cloe of my exchange server on the replay core? 1. if so, in case my exchange fails, can i fail over to the clone and ensure business continuity? 2. If not, and again in case my exchange fails, is it easy to fail back after fixing the server? You can backup your exchange and convert ot a VM for either VMWare or HyperV. Once it sits on a virtual platform you can fail over to it. However, as the software check the mounatbility of the databases at each snapshot you can be sure that you can easily recover any email or other exchange data. recovery is easy and quick, if you need to rollback (utilising live recovery) the whole volume that contains the database you will be surprised how quick teh data is accessible.